Dec. 27 (Bloomberg) -- Benazir Bhutto, Pakistan's former prime minister, died of injuries sustained in a suicide bomb attack on an election rally in Rawalpindi. She was 54. ``She's dead,'' a Bhutto aide, Imran Hayat, said as he sobbed in a telephone interview from Rawalpindi General Hospital, where she was treated after the blast. At least 15 people were killed in the bombing and more than 60 injured, police said. The opposition leader survived an assassination attempt on the night of her return to Pakistan in October after eight years in self-imposed exile. At least 136 people died when suicide bombers attacked her welcome procession on Oct. 19 in Karachi, where thousands of supporters had gathered to receive her. Harvard and Oxford-educated Bhutto was born in Karachi, Pakistan's biggest city, and was the eldest of two sisters and two brothers. She is survived by her husband, Asif Ali Zardari, son Bilawal and two daughters, Bakhtawar and Aseefa. Bhutto attributed her interest in politics to the assassination of her father, Zulfikar Ali Bhutto, the prime minister overthrown by General Mohammad Zia ul-Haq in a 1977 military coup. Zia ul-Haq went on to become president in 1978. The elder Bhutto, founder of the Pakistan Peoples Party, was hanged in 1979 after his conviction on charges of authorizing the murder of an opponent. Both Bhutto's brothers were also murdered. Bhutto was imprisoned for five years, mostly in solitary confinement, just before her father's execution. She later lived in London, returning to Pakistan in 1986. She was married to a man from a land-owning family of agriculturists in 1987. Zia ul-Haq's dictatorship ended when he was killed in a plane crash in 1988. Bhutto then became the first elected woman prime minister of an Islamic nation. Her government was dismissed in 1990. She won a second term in 1993 and was dismissed once again on charges of corruption in 1996. She had lived in Dubai and London since 1999 to avoid allegations of misstating her wealth and taking kickbacks on state contracts. While in exile, she spent time lecturing at universities and think-tanks around the world. She also remotely managed her party. None of the five charges against her received a court conviction. Zardari, Bhutto's husband and a member of the senate, also spent over eight years in jail on 18 corruption cases. He was released in 2004 without any convictions. Bhutto flew back to Pakistan after President Pervez Musharraf, 64, gave her amnesty on the corruption charges and agreed to give up control of the military by Nov. 15. In return, Bhutto didn't object to him being re-elected president by parliament and he won another five-year term. The former premier had said she would limit mass election rallies and campaign by telephone to avoid a repeat of the Oct. 19 terrorist attacks. The U.S. backed a partnership between Bhutto and Musharraf. President George W. Bush banked on the relationship to return stability to a nuclear-armed country that, according to U.S. intelligence reports and officials, is failing to combat a growing Islamist threat. 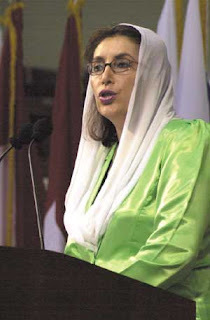 Bhutto's moderate view of Islam and close contacts with the Bush administration made her a potential target for extremists in the world's largest Muslim nation after Indonesia. Islamic militants had threatened to assassinate Bhutto on her return from exile. The twin bombings on her return to Pakistan in October also injured more than 500 people in the deadliest attacks since Musharraf took power in a coup in 1999. Musharraf had been informed that three people may be behind the attempts to kill her, Bhutto told reporters on Oct. 22, without identifying them. Bhutto received a letter from ``friends of al-Qaeda'' on Oct. 23, threatening more suicide attacks, possibly using women bombers, her lawyer Farooq Naik said. Bhutto also said her houses in Karachi and Larkana in the southern province of Sindh were under threat. Musharraf imposed emergency rule in Pakistan on Nov. 3 as the Supreme Court neared a decision on the legality of his re- election as head of state while also serving as army chief. Bhutto called Musharraf's decision to suspend the constitution and impose emergency a mini martial law and said it jeopardized her power-sharing talks with the army ruler. can you prove that it was suicide bombing? Al Jazeera showed a ripped off Police Mobile besides the Land Cruiser Jeep which was carrying Benazir.